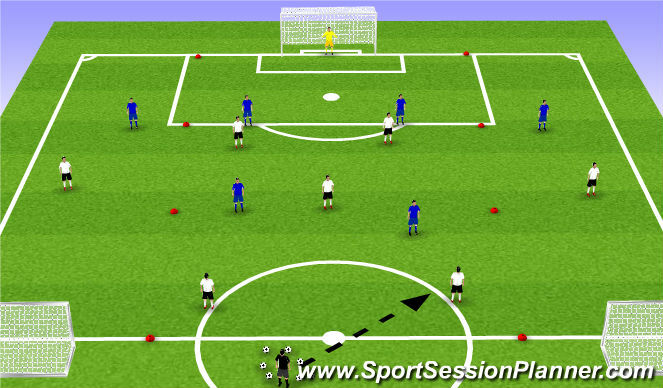 Football/Soccer Session (Moderate): Day 4: Switching the Point of Attack. A: "Bad Numbers" or a "Numbers Down" area of the field is where there are more of them than us. B: "Good Numbers" or a "Numbers Up" area of the field is where we there are more of us than them. Keeping the ball involves a constant search for good numbers. After two or three short passes, chances are that the numbers are going to start turning bad. This is not a bad thing. It means that the defensive team is unbalanced and that is when we search for the good numbers and attack it quickly! It takes players that can see and feel when numbers are getting bad and look for that next ball to get into a better area to relieve pressure. It also takes players off the ball that will remain disciplined in their spacing. An ineffective player will either dribble into a bad numbers situation or play their teammate into bad numbers and pass their bad situation off to someone else. An effective player will see when there are bad numbers and look for that ball out of pressure. A dynamic player can see and feel when their are bad numbers and play that ball out of pressure. The faster we do this, the more time we have to take advantage of any gaps in their defensive unit. 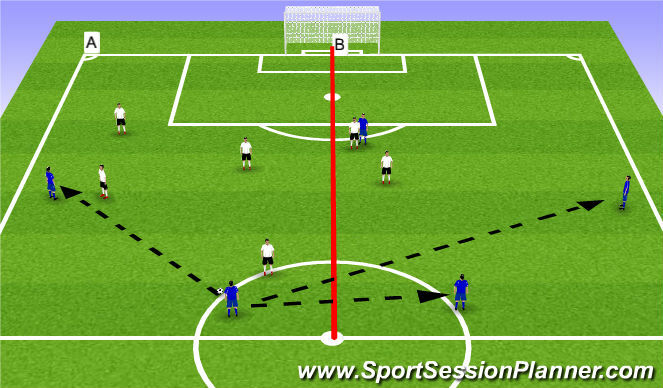 A) 1) The player sprints to the pole, back peddles to create separation from the "defender," keeping the game in front of him. 2) Recieves with his back foot and quickly switches the point of attack. 3) Return to the line you came from. B) 1) The player sprints to the pole but now puts his body between the mannequin and the ball as to shield off the defensive player and quickly switches field. C) Dutch Circle- 4 Working, 8 in active rest. Explain and Emphazize 3 step rule after performing the technique. Demand perfect technique. Coaching Points: 1) Must receive back foot 2) Speed of Play to take advantage of numbers 3) Passer must look to deliver the ball to the back foot 4) Receiver must do the work to receive with back foot. 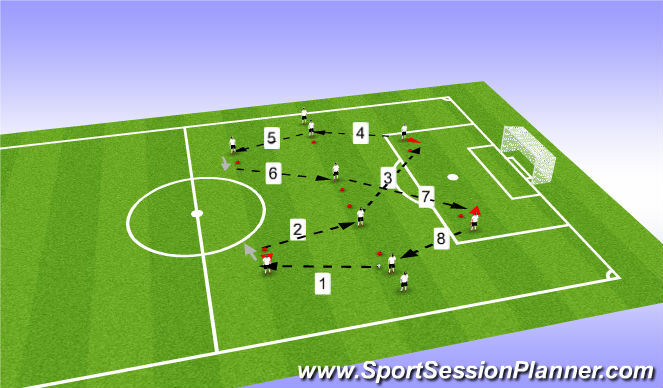 Passing Sequence: 10 players Aim is to switch the point of attack using CM and CB. We will begin with 1 ball at CB&apos;s feet. Ob will back out of pressure, keeping their body open, take a touch up the line, play the CM who receives with his back foot to play the right winger that has checked to receive the pass. The RW now plays the "CB" that has backed out, creating space, and continue the pattern. You will follow your pass. Coaching Points: 1) Receiving players must create a good angle of support. 2) Receive with back foot. 3) Positive 1st touch. 4) Accurate pass to players back foot, with PACE. 5) Timing of support. 6) Players must back out of pressure to create space b/t themselves and the defender. 6 Goal Game: 6 v 6 +1. The attacking team looks to find "good numbers" or any 1 v1 situation and quickly changes the point of attack to get to that area. The attacking team can score on any of the 3 goals in the direction they are attacking. The attacking team must have patience when choosing to go forward. If there is a 1 v 1 situation, we must take it. Small Sided Game: Attacking Team 2-3-2. Defending Team: 4-2. Play will always start from the coach. The attacking team must move the ball into both channels before they can go to goal. The attacking team must have patience again in choosing when to go forward. 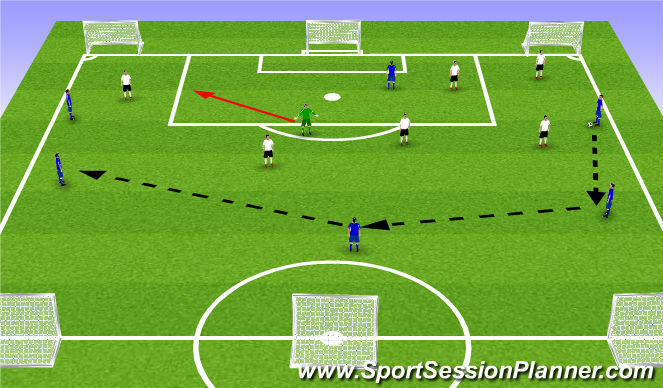 Encourage players to take people on in the attacking third in a 1 v 1 situation. Coaching Points: 1) Discipline in the attacking teams spacing 2) Are players looking for " good numbers" (numbers up) situations or are they forcing the ball into areas where we have "bad numbers?" 3) Encourage patience in the attack. 4) Are players supporting in good angles? 5) Speed of play 6) Are our CM&apos;s swiging the ball with pace? Small Sided Game: Attacking Team 2-4-2. Defending Team: 4-2-2. 1) No restriction play. 2) The idea is that the team in attack will continue to look for "good numbers" situations. 3) Swing the ball quickly to take advantage of these situations.